You are here: Home / Laughter / Who is Doctor Madan Kataria? Who is Doctor Madan Kataria? Doctor Madan Kataria is an allopathic physician from Mumbai, India who is best known for inventing what he calls “Laughter Yoga”. 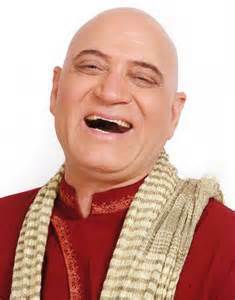 He is also known as the “Guru of Giggling”. Dr. Kataria was writing an article for a health magazine and remembered his interest in the Reader’s Digest “Laughter, The Best Medicine”. Upon exploring his curiosity, Dr. Kataria discovered a large amount of scientific evidence supporting the hypothesis that laughter is good for both mental and physical health. Laughter reduces stress, lowers blood pressure, releases feel-good endorphins, exercises abdominal, leg, back, shoulder, and respiratory muscles, and improves cardiac health, among other things. Dr. Kataria decided to come up with a way to take advantage of these benefits. While pacing his apartment one day at 4:30am, he thought of an idea: he would start a laughter club. And, on that very same day in 1995 he did just that, in a local Mumbai park with only four other people. Regulars of the park questioned the doctor’s sanity at first when he just started laughing. But after convincing four others to move to a corner of the park and laugh with him, people began to get curious. Once he explained the science behind what they were doing, skeptics turned to believers and participation grew. Since its modest beginnings, the Laughter Yoga movement has grown to include over 6000 clubs in over 60 different countries. It has been covered by prestigious publications including National Geographic, TIME magazine, and the Wall Street Journal, and has been featured on the BBC, CNN, and the Oprah Winfrey show. Today, Dr. Madan Kataria is a motivational speaker for businesses and organizations worldwide. He frequently appears on television and radio shows to discuss his ideas. He remains active in various research projects measuring the benefits of laughter and acts as a corporate consultant for holistic health, stress management, and leadership skills. The confirmation of his theories through recent studies conducted in the USA and Bangalore, India using self-induced laughter have marked a turning point in the acceptance of Laughter Yoga in its various applications. Laughter Yoga has since been implemented in schools, businesses, hospitals, and retirement homes, among other areas, in countries all over the world. Laughterworks specializes in creating an environment filled with laughter. To learn more of what we could do to enhance your conference feel free to contact us: info@laughterworks.com.au or (+61) 438 545 607.